At last, a solution to that recurring problem of removing and fitting small tyres. These ingenious tools make light work of breaking the beads and changing tyres fitted to all types of small wheels including hub fitting, bearing centre and plain bore centre wheels. 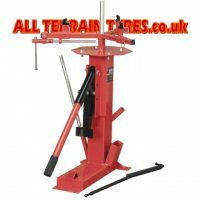 These tyre changers and bead breakers will change ATV tyres, trailer tyres, turf tyres and golf course tyres from 4" rim diameter upwards. Watch the demonstration videos to see them in action.